Spirit Day is an international campaign established to support the problem that cannot be ignored. Annually bulling of gay and lesbian teenagers leads to hundreds of suicides. Started in 2010, Spirit Day calls on people to support LGBT youth. Spirit Day was promulgated by the Canadian teenager Brittany McMillian in early October 2010. The first observance took place on October 20, however, later it was moved to October 16, that's its current date. 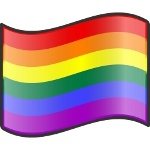 All people are encouraged to wear purple to show support for LGBT youth (lesbian, gay, bisexual, transgender). Purple was chosen to be the color of the campaign, since it's one of the colors of the LGBT flag. Many websites also show their support of Spirit Day by adding a prominent purple shade to their design. The campaign received great support from the Hollywood celebrities. The very first 2010 campaign was supported by Ellen DeGeneres, Hilary Clinton and the cast of Glee. The list of supporting stars was expanded during the next years. People may show their support of LGBT youth by wearing purple ribbon or purple clothes or add a purple hue to their Facebook, Twitter and Google+ profile photos.